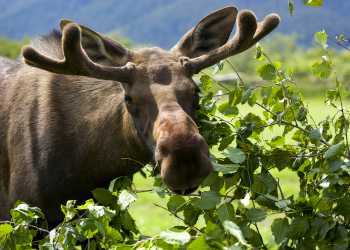 With approximately 1,500 moose, Anchorage’s favorite residents are on four legs. Even in the heart of the city, moose are a regular sight as they browse through parks, greenbelts and even the occasional backyard garden. Play it right, and you can see a moose in the first hour of your trip. Moose are just as likely to turn up on downtown streets as in parks, but there a few locations known for moose. Kincaid Park, Potter Marsh and the Chugach Mountains are all good bets for sightings. Moose tend to be most active in the morning and evening hours, sitting out the warmest part of the day in shady, forested areas. Keep a sharp eye out, you might spot one on even driving around during a sightseeing tour. Though present year round, the beginning and end of summer are special times. Watch for newborns at the end of May. In late September and October, adult moose are in “rut” – a breeding time when males joust with their antlers in order to win the attention of females. Guaranteed moose views are always waiting at the Alaska Zoo in South Anchorage and at the Alaska Wildlife Conservation Center in Portage.